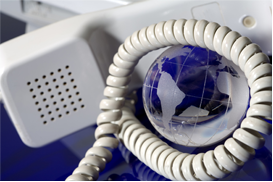 VoIP - Internet Phone Systems for your business! Why have an Internet-based phone system? We’re glad you asked! The information below should bring you up to speed. If you think VoIP might be the solution for your business, we’d like to talk with you! Look what you get with VoIP…! Add enterprise-grade calling features, improve reliability, and enable mobile users—while cutting your phone bills by over 50%. 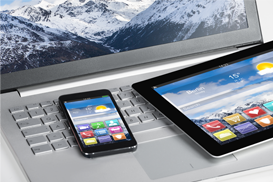 Internet Phones – Keeping you CONNECTED! Let’s start with the obvious one. This is a service for which the calling platform and features are hosted at the service provider location—as opposed to a server that resides in a closet at your office. 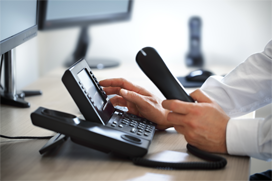 With a hosted VoIP system, your employees connect to the system via “IP desk-phones” (see below) that plug into the Internet. They can make calls to any traditional telephone. The benefit of a hosted system is that it’s simple to setup and manage because you don’t have to worry about equipment. It also saves you a lot of up-front money. This is a phone that makes and receives telephone calls over an “IP” network, such as the Internet. That’s instead of making calls over the traditional public switched telephone network (PSTN). This is a methodology and group of technologies for the delivery of voice communications and multimedia sessions over Internet Protocol (IP) networks. Which is a complicated way of saying that your voice goes over the Internet, instead of over the phone lines. This is an app that lets a smartphone make and receive calls over the business network, using the same phone number as your IP desk-phone. A Windows or Mac computer program that allows you to make or receive calls over the Internet using the same number as your IP desk-phone. But—hosted phone technology CAN seem daunting – especially if you’ve only ever dealt with traditional phone systems. Let’s start with the obvious one. This is a service for which the calling platform and features are hosted at the service provider location—as opposed to a server that resides in a closet at your office. With a hosted system, your employees connect to the system via “IP desk-phones” (see below) that plug into the Internet. They can make calls to any traditional telephone. The benefit of a hosted system is that it’s simple to setup and manage because you don’t have to worry about equipment. It also saves you a lot of up-front money. You manage your hosted system by logging in to an online control panel. Administrators can manage moves, adds and changes with just a few clicks. They can control all settings, including auto attendant menus, hunt group setup, and more. They can also administer multiple offices and remote users from anywhere. This service rings multiple people at once to ensure no call goes unanswered. The system sequentially searches through the hunt group list to find an inactive line, and will then ring that line. 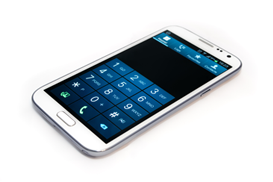 This feature automatically forwards calls to mobile phones and other numbers, or rings multiple numbers at the same time. This feature ensures messages get through faster. Users can save, delete and forward voicemail messages and faxes just like with any email.